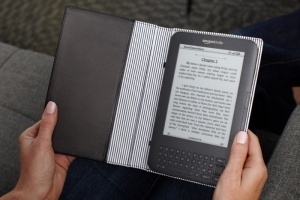 Rumors are beginning to circulate that the world's largest internet retailer, Amazon, will launch several new versions of their Kindle e-readers and tablet in July, including a revamped monochrome e-reader with built-in lighting, according sources familiar with the matter cited by Reuters. According to the report, Amazon has been ramping up production of the new Kindle, which is said to run E Ink's display and will be available in wireless and 3G versions. The source also stated that Amazon plans to launch a new tablet sporting a 8.9-inch display to compete closer with the iPad nearer to the holiday season later this year. It's not entirely surprising news though, with Barnes and Noble having already released a e-reader with lighting and Amazon tipped to follow up with a product of its own. The included light would certainly make sense, especially since many existing Kindle owners have complained about low-light visibility and subsequently had to purchase external lights to attach to the reader to use it in the dark. Speculation surrounding a color e-ink display version currently suggests that the technology requires more time to be perfected, so it's unlikely we'll see Kindle e-readers sporting these displays until at least next year. The unnamed source further confirmed this, as well as explaining that talks have been held with E Ink but no concrete decisions had been made by both parties yet. "We don't comment on our customers' launch plans," said Sri Peruvemba, chief marketing officer for E Ink Holdings, Amazon's e-reader display supplier, when asked for further comment. "E Ink is an innovator and for the past 10 years, we have consistently delivered new products, major enhancements to existing products, and unique designs, so it is not surprising that there is constant speculation about what we will do next."